Rubis Photo Gallery Photographs of the Free French Naval Forces submarine Rubis and her crew. Rubis in Action (Google Map) The map shows the positions of all of Rubis's documented actions. Rubis Today (Diving Videos) Rubis was scuttled in 1957 off St. Tropez, France, for sonar target practice. Tribute to Submarines By Winston Spencer Churchill, Prime Minister. Estuary Panorama (Scrollable Panorama) of the Tay Estuary with wartime points of interest highlighted. What did you do in the war, Dundee? There is a widespread if erroneous perception that the Second World War largely bypassed Dundee. In fact nothing could be further from the truth. Dundee's role was a variety act par excellence, with one of the country's largest submarine bases taking star billing. HMS Ambrose, comprising a number of buildings close to the port area, was formally commissioned on the 18th April 1940. Prior to this, HMS Triton, sailing from the Tay, had unfortunately sunk in error another Dundee based submarine, HMS Oxley. This inauspicious start to the war notwithstanding, Dundee's submarines went on to produce some conspicuous successes. These include the patrols of the Free French Rubis, which, with 31 sinkings, was one of the top scoring Allied boats. 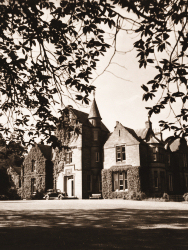 Dundee was also home to Jessie Jordan, one of the first German spies. It was visited by General de Gaulle and Vyacheslav Molotov, and was the unfortunate target of not a few German bombs. Meanwhile, the Home Guard and the Wardens were most assiduous in protecting the populace from threats both real and imaginary, whilst the recruits to the 1st Battalion the Highland Regiment improbably demonstrated their amphibious skills by jumping with full kit into Broughty Ferry Harbour. Dundee’s war is a rich amalgam of contributions by many dedicated men and women. Some had a pivotal influence on the war, others were of marginal importance, whilst some were plainly farcical. Whatever their worth, they were enthusiastically pursued, and all played their very valuable part, large and small, in defeating the most potent threat to civilisation since the fall of the Roman Empire. HMS Triton (N15) was a British T class submarine of the Royal Navy. Her keel was laid down on 28th August 1936 by Vickers Armstrong at Barrow-in-Furness. She was launched on 5th October 1937, and commissioned on 9th November 1938 with Lieutenant Commander H. P. de C. Steel in command. She displaced 1,090 tons on the surface, had a length of 275ft (84m), a beam of 26ft 6in (8.1m) and was propelled by twin diesel engines each producing 2,500hp (1.86MW). She also had twin electric motors each producing 1,450hp (1.08MW). 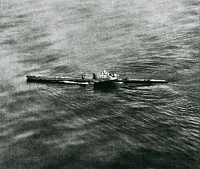 She was capable of 15.25 knots (28.7 km/h) on the surface and 9 knots (20km/h) submerged. With a complement of 59 her range was 4,500 nautical miles at 11 knots (8,330km at 20km/h). She was armed with 6 internal forward facing torpedo tubes, 4 external forward facing torpedo tubes, 6 reload torpedoes and a 4 inch (100mm) deck gun. Triton had a brief but eventful career, serving in the North Sea and the Mediterranean. Triton was declared lost with all hands on 18th December 1940 after allegedly being sunk by mines in the Strait of Otranto. HMS Oxley was an O class submarine serving in the Royal Australian Navy (as HMAS Oxley) and the Royal Navy. Oxley was laid down by Vickers-Armstrong Limited at Barrow-in-Furness, in March 1925. She was launched on the 29th of June 1926, completed on the 22nd of July 1927, and commissioned into the Royal Australian Navy on the 1st of April 1927. She displaced 1,835 tons on the surfaced, had a length of 275 feet (84m), a beam of 27 feet 7 inches (8.4m) and was capable of 9 knots (17km/h) submerged. After her Royal Australian Navy career came to an end, Oxley was recommissioned into the Royal Navy on the 10th of April 1931. 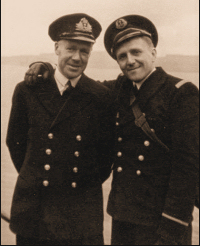 Following the outbreak of World War II, Oxley was assigned to patrol duties off the coast of Norway. On 10th September 1939, the submarine HMS Triton was also patrolling in the area. Believing her to be an enemy submarine, Triton fired two torpedoes at Oxley. Both torpedoes hit and sank her with only two survivors, which were recovered by Triton. 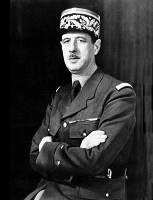 Charles André Joseph Marie de Gaulle (22nd November 1890 – 9th November 1970) was a French general and statesman who led the Free French Forces during World War II. He later founded the French Fifth Republic in 1958 and served as its first President from 1959 to 1969. In France, he is commonly referred to as Général de Gaulle or simply Le Général, or familiarly as “le Grand Charles”. De Gaulle was born in Lille, the second of five children of Henri de Gaulle, a professor of philosophy and literature at a Jesuit college, who eventually founded his own school. He was raised in a family of devout Roman Catholics who were nationalist and traditionalist, but also quite progressive. Since childhood, he had displayed a keen interest in reading and studying history. Choosing a military career, de Gaulle spent four years studying and training at the elite military academy, Saint-Cyr. In 1940, With British support, de Gaulle settled himself in Berkhamstead (36 miles northwest of London) and began organising the Free French forces. 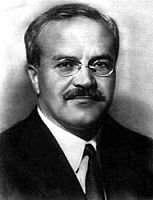 Molotov (9th March 1890 – 8th November 1986) was born Vyacheslav Mikhailovich Skriabin in the village of Kukarka, Russia. He was educated at a secondary school in Kazan, and joined the Bolshevik faction of the Russian Social Democratic Labour Party in 1906. For his political work he took the pseudonym Molotov (from the Russian molot, meaning “hammer”). He served as Chairman of the Council of People’s Commissars from 19th December 1930 – 6th May 1941 and as the People’s Commissar for Foreign Affairs from 3rd May 1939 – 1st June 1956. Rubis was a Saphir class minelaying submarine which served in the French Navy and Free French Navy during the Second World War. Built by Arsenal de Toulon. She was laid down on 3rd April 1929, launched 30th September 1931 and commissioned on the 4th April 1933. Rubis was 66 metres long, displaced 670 tons and had a complement of 3 officers and 37 men. She was powered by a diesel/electric motor with 2 shafts producing 1300 BHP on the surface and electric motors while submerged. Maximum speed was 12 knots on the surface and 9 knots submerged. Armament consisted of a 3" gun, 2, 13mm Anti-Aircraft guns, 3 21.7" torpedo tubes and 2 15.7" torpedo tubes. She also carried 32 mines. Rubis was already based at Dundee when France surrendered in July 1940, but almost to a man her crew under the charismatic Georges Cabanier agreed to continue the fight against the Nazis under the flag of the Forces Navales Francais Libre, the Free French Navy. By the end of the war in 1945 Rubis had carried out twenty-eight operational patrols, laying almost 700 mines off Norway and in the Bay of Biscay and sinking many ships. She returned to France was decommissioned on 4th October 1949. She was then deliberately sunk as an Asdic target in the Mediterranean where she remains today, a popular site for recreational divers. Jessie Jordan, born in Glasgow as Jessie Wallace the illegitimate daughter of a Coatbridge housemaid, married a German waiter working at the Royal Hotel in Dundee in 1912. She stayed in Germany during the war and, after he husband died in 1918, set up a hairdressing salon in Hamburg. By the mid 1930s Jessie’s daughter Marga, a promising singer, was trying to join a Hamburg opera company but was unable to prove her Aryan descent. Marga’s ex-husband had also managed to lose much of Jessie’s money in a failed business scheme. In 1937 Jessie decided to return to Scotland to act as housekeeper to her recently widowed brother, a Perth railwayman, and trace her long-lost father’s relatives and thus rescue Marga's singing career. Jessie’s plans came to the attention of Abwehr, the German secret intelligence service, and she was recruited as an agent. No records survive that offer a clue as to Jessie’s motives for agreeing to spy for the Nazis; perhaps she was persuaded that this would benefit Marga and Marga’s infant daughter also called Jessie. Once back in Scotland she saw a new business opportunity in a hairdressing salon at 1 Kinloch Street, Dundee. No master spy, Jessie soon gave herself away by the most basic errors in espionage tradecraft. MI5 were quickly aware of her correspondence with a known Abwehr address in Hamburg, but they were unaware of the Dundee hairdressing salon until alerted to it by Mary Curran, a local woman who worked there. Always suspicious of this rather exotic figure, Mary found evidence of Jessie’s amateurish espionage carelessly hidden in the Kinloch Street salon and, with some difficulty, managed to persuade Dundee Police that something was very wrong about this woman who took monthly trips to Germany, her luggage stuffed with documents. On occasions Jessie would take Mary Curran’s daughter Charlotte with her on visits to the seaside as she hurriedly sketched details of coastal defences. She also made intelligence gathering journeys to Aldershot and Southampton. But her principal role for Abwehr was as a post box for German agents in the United States. And it was letters intercepted on their way to Jessie from fellow Abwehr agents in New York that allowed the FBI to break a substantial Nazi spy ring in the United States. Jessie Jordan was arrested at Kinloch Street on 2nd March 1938 and spent the war years in jail. As a German citizen, she was repatriated in 1945 and died, in Hamburg, in 1955.